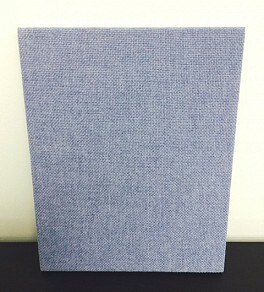 These non-acoustical fabric covered wall panels are the ideal solution for highly tackable wall surfaces in conference rooms, offices, hallways, and classrooms. Hi-Tack panels are constructed from 1/2 in., or 3/4 in. thick 24 PCF density mineral board wrapped in your choice of fabrics from the FR 701 Collection from Guilford of Maine or factory-approved, customer provided materials. When paired with HardSide acoustical panels, Hi-Tack provides highy tackable wall surfaces that blend visually with sound absorbing panels. Highly tackable fabric faced wall panel. Wrapped in standard in-stock fabric from Guilford of Maine or factory-approved, customer-selected material. Available in panel sizes up to 4 ft x 10 ft (1/2 inch thickness) or 4 ft x 8 ft (3/4 inch thickness).